2019 is the key year for the new re-launch of the wind power sector in Spain, mainly due to the execution of the wind farm projects of the renewable auctions that were carried out during 2016 and 2017. The sector is committed to installing 4,600 MW in the peninsula, plus the Canarian quota to 2020. After a few years of freezing, the wind turbines sector has once again shown its strength in 2018, closing the year with 23,484 MW and having covered 19% of the electricity consumption needs of Spaniards. In total, renewables have covered 40% of electricity demand in Spain in 2018. “The vision of the wind energy industry for the next few years is optimistic. The installation forecasts for wind power are approximately 2,000 new MW per year. 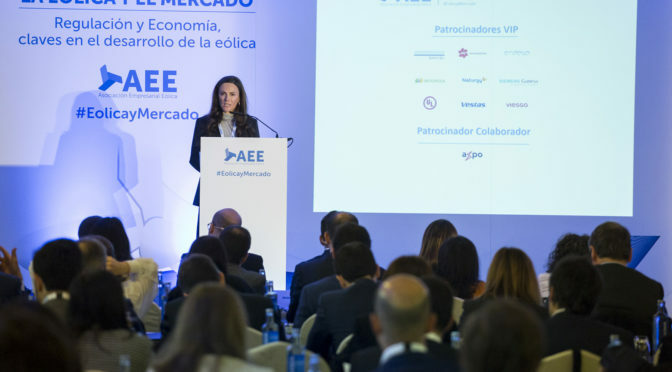 This greater contribution of wind turbines will affect, for example, considerably, in the increase of employment in the sector, and is evolving towards a more active participation in the technical and economic operation of the electrical system”, stressed Rocío Sicre, president of the Spanish Wind Energy Association (AEE) in the inauguration of a new edition of the day La Eólica and Mercado, which celebrates today in Madrid. A day in which more than 170 professionals from the wind energy sector have gathered to identify and debate on the elements that are still lacking in order to start building the next Spanish structural energy change: moving from 40% renewable to at least 70%. “Wind power has been a protagonist in the last decade, allowing us to double the renewable generation, with all the economic, industrial and environmental benefits that this has meant for the country. The next few years will be key to increasing the contribution of wind in Spain,” said Sicre. At the expense of the presentation of the Integrated National Energy and Climate Plan by the Ministry for the Ecological Transition on February 22 – as announced yesterday by Minister Teresa Ribera – as well as the possible schedule of future auctions of renewable power, the sector works so that the rest of the pieces of the ‘puzzle’ of the energy transition fit together: the technical, economic and regulatory elements. These will be the main topics of debate today in the day of AEE. After the success of previous years, AEE returns with a new edition of the day La Eólica and Mercado, on this occasion entitled Regulation and economics, keys in the development of wind energy. The focus, on this occasion, is somewhat innovative compared to previous years -more oriented to assess the participation of wind turbines in the adjustment markets, the impact of new markets such as the intraday continuous or the future PPAs-. However, both the evolution of the sector during the past year, and the anticipated changes have made necessary an approach that responds to the challenges of the massive integration of wind power in the network. The event focuses on evaluating the prospects for the development of new wind farm projects, both those that have arisen as a result of renewable auctions and the projects that are being built with merchant risk hedges. Likewise, the new auctions will be analyzed, the regulation on hybridization of projects, the repowering or the European perspectives, in a scenario of progressive integration to consolidate the European single market. Representatives of the main companies of the wind turbines sector participate in six different topics: Barriers and challenges of the integration of wind power supply, regulatory novelties, technical operation of the electrical system, economic operation of the market, merchant risk coverage, and the role of the Autonomous Communities in the monitoring and processing of wind farms. 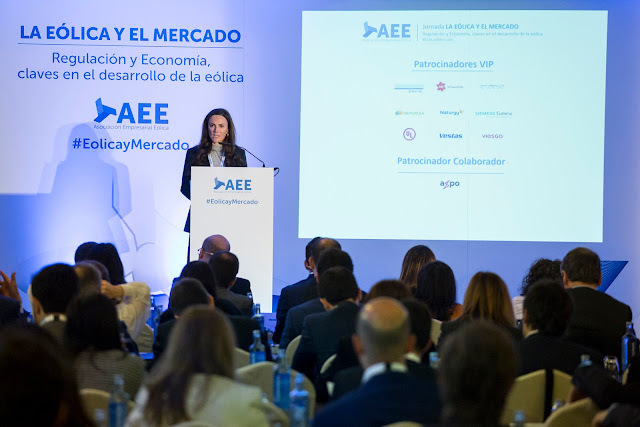 The day La Eólica and the Market has the sponsorship of Axpo, DNV GL, EDPR, Endesa, Iberdrola, Naturgy, Siemens Gamesa, UL, Vestas and Viesgo. The Spain Wind Energy Business Association (AEE) is the voice of the wind sector in Spain. With nearly 200 associated companies, it represents more than 90% of the sector in Spain, promotes the use of wind energy and defends the interests of the sector.